Russia’s defence minister has already ordered work to begin on new land-based intermediate range missiles, to be ready within two years. Talking about the cold — Rising temperatures in the Himalayas, home to most of the world’s tallest mountains, will melt at least one-third of the region’s glaciers by the end of the century (Warning: source may be paywalled; alternative source) even if the world’s most ambitious climate change targets are met, according to a report. If those goals are not achieved, and global warming and greenhouse gas emissions continue at their current rates, the Himalayas could lose two-thirds of its glaciers by 2100, according to the report. 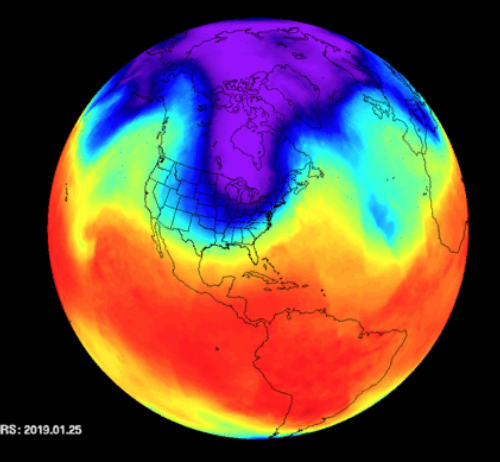 Polar vortex — It was cold in the Continental US. Colder than Alaska, Mars (technically), and even parts of Antarctica, which isn’t so surprising because it’s presently summer in Antarctica, but sounds wild nonetheless. A new gif by NASA’s Atmospheric Infrared Sounder (AIRS) on the Aqua satellite offers a visual depiction of the dramatic and deadly cold snap, demonstrating temperatures plummeting to -40C. Global warming could temporarily hit 1.5C above pre-industrial levels for the first time between now and 2023, according to a long-term forecast by the British Met Office. House Democrats tell Ajit Pai to stop screwing over the public — The US House Commerce Committee is “reassuming its traditional role of oversight to ensure the agency is acting in the best interest of the public and consistent with its legislative authority,” Commerce Committee Chairman Frank Pallone, Jr. (D-N.J.) and Communications and Technology Subcommittee Chairman Mike Doyle (D-Penn.) said. FBI wants your DNA — There are plenty of reasons to be wary of at-home DNA testing, particularly if you’re concerned about genetic privacy. That’s especially true now that it’s come to light that FamilyTreeDNA, one of the largest private genetic testing companies, is cooperating with the FBI to give its agents access to its genealogy database. German curbs Facebook — Facebook has been ordered to curb its data collection practices in Germany after a landmark ruling that the world’s largest social network abused its market dominance to gather information about users without their consent. AI hears your anger in 1.2 seconds — MIT Media Lab spinoff Affectiva’s neural network, SoundNet, can classify anger from audio data in as little as 1.2 seconds regardless of the speaker’s language — just over the time it takes for humans to perceive anger. Aussie cop used police databases for Tinder trawls — An ex-cop in Western Australia has been gaoled for six months for using police databases to snoop on the records of dozens of women he’d encountered on dating sites such as Tinder and PlentyOfFish. Russian government accessing corporate data — A Dutch security researcher found credentials for the Russian government’s backdoor account for accessing servers of businesses operating in Russia. Huawei admits security issues — In a remarkable piece of honest self assessment, Huawei has produced a letter to a UK House of Commons committee member in response to security concerns raised by the UK Huawei Cyber Security Evaluation Centre (HCSEC) in its annual report, a body that includes Huawei, UK operators and UK government officials. Billions more people … or not — By 2050 there will be 9 billion carbon-burning, plastic-polluting, calorie-consuming people on the planet. By 2100, that number will balloon to 11 billion, pushing society into a Soylent Green scenario. Such dire population predictions aren’t the stuff of sci-fi; those numbers come from one of the most trusted world authorities, the United Nations. But what if they’re wrong? Not by a rounding error, either. By billions. Eating like you’re going to save the Earth — That’s what Brian Kahn tried for Gizmodo. French government pays out to Holocaust survivors — Around three-quarters of a century after the Holocaust ended with the extermination of at least six million Jews, some survivors, as well as victims’ families and estates, are receiving reparations from France, in acknowledgment of the government’s role in deporting them to Nazi death camps via French trains. Any good news? A little: the UK’s CO2 emissions peaked in the year 1973 and have declined by around 38% since 1990, faster than any other major developed country.